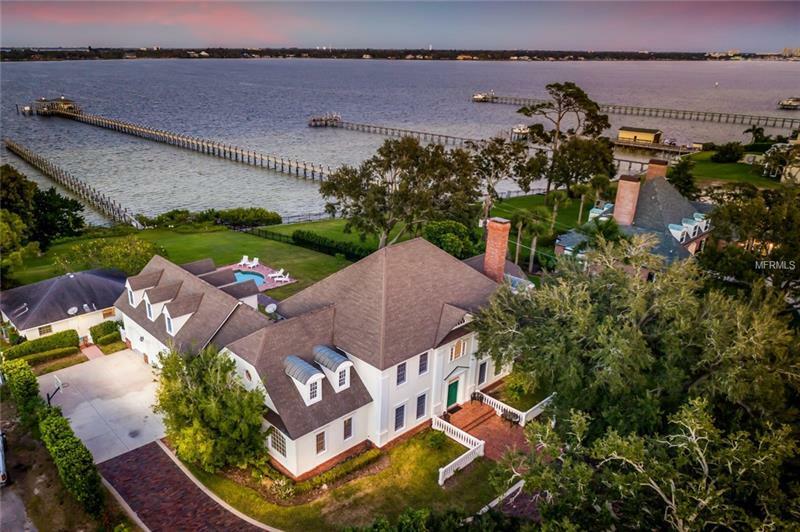 COLONIAL MASTERPIECE ON THE MANATEE RIVER!!! Stunning, panoramic water views are the focal point of this privately situated, two story, custom-built home on 1.12 acres. The interior of the estate is true to form with architectural accoutrements including a grand entrance winding staircase in the foyer, dentil and multiple wall moldings, wood floor, a back staircase and countless symmetrically placed windows allowing natural sunlight to flow from room to room. A wood burning fireplace with detailed and carved wood compliments the formal living room. Special dining occasions can be enjoyed in the formal dining room. The kitchen features washed cottage finish cabinets with a center island, gas cooktop with hood, trash compactor, Sub-zero refrigerator, a wine refrigerator, and two refrigerator drawers. The adjacent breakfast room has a butlerâs pantry. While the master bedroom is located on the first floor, the second floor has four bedrooms, bonus room, and a billiards room above the garage. Enjoy the view of the river from several well-placed sitting porches. A detached 846 sq. ft. guest house, located adjacent to the heated pool, is the perfect get away for guests. It has a cathedral ceiling, bedroom, full bath, Murphy bed, and kitchen. It also serves well as an in-lawâs quarters or for live-in caregivers.Waterfront adventures begin in your own backyard with 169â of direct frontage on the Manatee River, and a 300â dock and boat lift. Direct access to Tampa Bay, ICW and Gulf of Mexico.